As any musician, athlete or computer nerd knows, hand dexterity and strength is a vital tool of the trade! 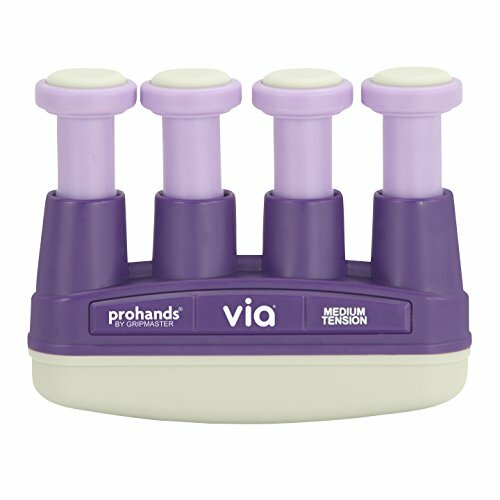 Using a Prohands Hand Exerciser can bring great results. Sometimes you need to strengthen the muscles of the hand - especially if you use them intensively. For instance, nearly all musicians rely on their hands to hold, strum, beat, strike and balance a musical instrument. Hands really take a thrashing! Therefore, the stronger the hand the more confident the musician! Athletes and sportspeople in general rely on their hands for grip and their wrists for pulling and pushing power. In baseball a strong grip is vital, as it is in golf. Any problems in the hand area are nearly always associated with weakness and lack of dexterity. So,what can be done to try to rectify (or prevent) these 'faults' which can seem insurmountable? There are many hand exercisers on the market, but the thing that makes the Prohands models stand out is that they exercise each finger individually. 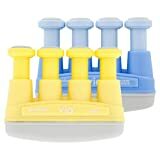 For instance, you can buy balls which fit into the palm of your hand and which you squeeze to build up the hand muscles, and you can buy hand stretchers - but Prohands Hand Exercisers not only strengthen the hand, but the individual fingers too. 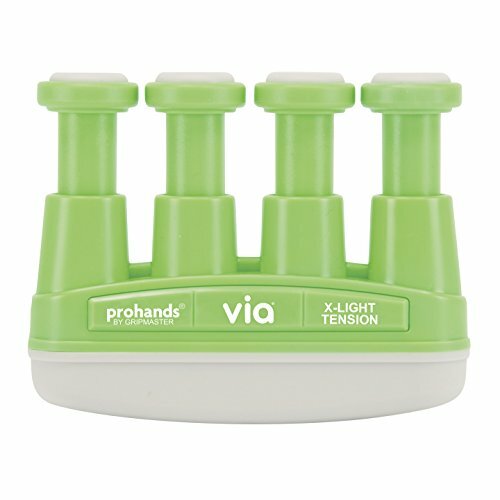 Another advantage is that the Prohands Hand Exercisers come in a range of models and strengths so that you can slowly build up your grip and muscle strength gently, over a period of time. Each model has a range of tensions, meaning that pressing down the pistons takes a certain amount of weight. These range from the 'Via' entry level model which begins with a pressure on each piston of 2 lbs, to the 'Pro' model, the most advanced exerciser which goes up to extra heavy tension. The Gripmaster 'Via' has a series of graded models especially recommended for musicians. Since strength and dexterity are vital to all musicians, the 'Via' seems to be worth exploring. According to the reviews on Amazon, not only trumpet players, but pianists, clarinet players, guitarists and people with arthritis are also benefiting from this particular model. Apart from musicians, this model is also used by people learning sign language, and those suffering from circulation problems. This seems to be a good all-round model which is fine for the beginner. I had a bad accident many years ago which left the fingers of my right hand weakened and without feeling in my finger tips. When I decided to learn to play the cornet last year I found dexterity and speed when hitting the valves a bit of a problem. No one noticed because I was a beginner, but I didn't want this to be an ongoing problem. After only two weeks of using the Prohands Gripmaster model I have definitely noticed an improvement. I go through the exercise regime every day and already I can feel that my hands, in particular the fingers of my right hand, are improving in their ability to move quickly across the valves. I also have improved pressure when hitting the valves. Here is a link to an exercise regime for athletes - the regime I use is for musicians but the layout and exercises are similar. You will be asked which kind of exercise regime you would like when ordering. Including Baseball, Rock Climbing, Golf, bowls, etc. 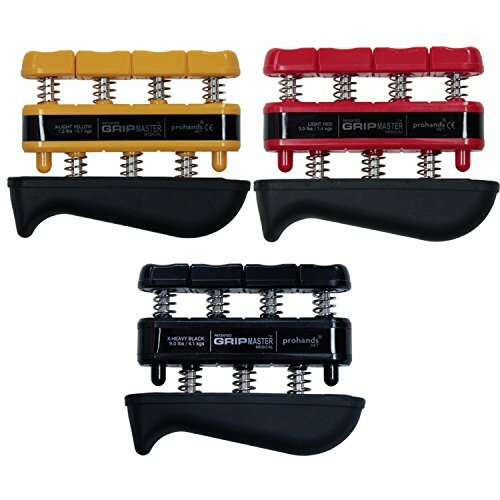 Getting a grip is an absolute must for most sporting endeavours and athletic challenges! 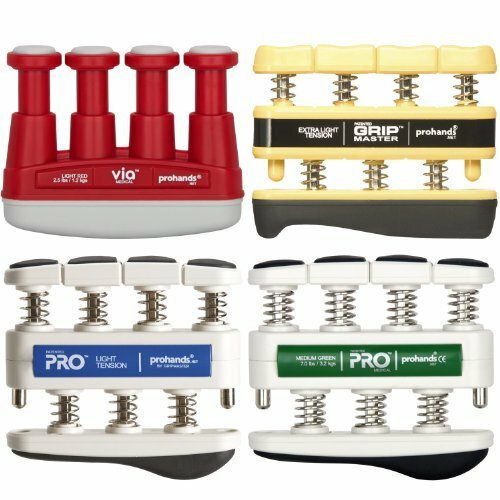 So the Prohands 'Pro' is a great hand exerciser for all kinds of sporting activities - including fishing where a strong wrist is vital. 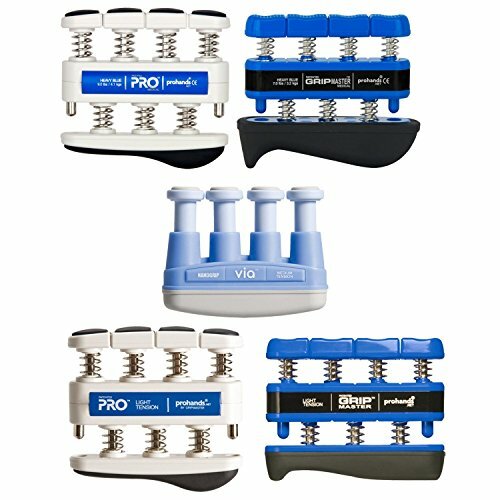 The 'Pro' model is Prohands' most advanced exerciser aimed at professional sportspeople seeking maximum strength. 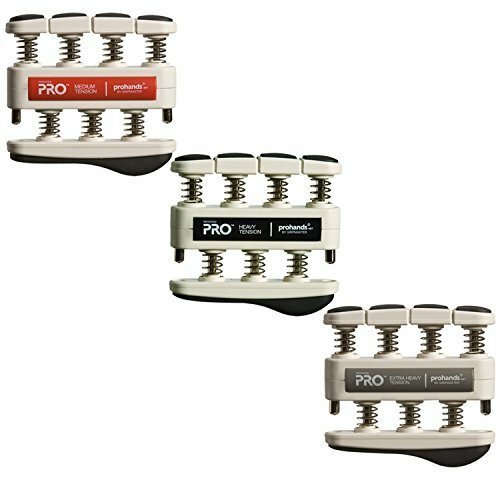 See what a golfer and a baseball player have to say about the Prohands 'Pro' exerciser. This model is available in medium, heavy and extra heavy tensions. As we have just seen, Prohands has developed a variety of models to suit every perceived need. The items shown above are, I believe, the solid foundation models which will suit most people's needs. 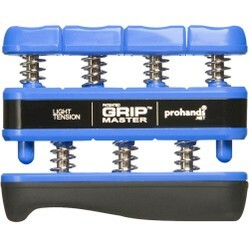 A Prohands Gripmaster Hand Exerciser with 21-Minute DVD Featuring David Magadan, the hitting coach for the Boston Red Sox. And here's the Commuter Pack of Prohand Exercisers which is 'perfect for dad during his commute'. This package includes one each of the Medium (7 lb resistance), Heavy (9 lb resistance), and Extra-Heavy (11 lb resistance) prohand exercisers. Other models available are 'The Rockstar', 'The Golfer', 'The Medical Hand Exerciser', 'The Swat Team', 'The Typing Trainer' and 'The Marine Corps Companion', 'The Patriot', 'The Arthritis Annialator' (! ), 'The Terminator' and 'The Union and Confederate'. Prohands Hand Exercisers claim to be the world's number 1 hand exercisers and I can believe it. I am using one and I have definitely noticed the difference. And it feels so good too! Those hand muscles really enjoy being gently stretched and toned! 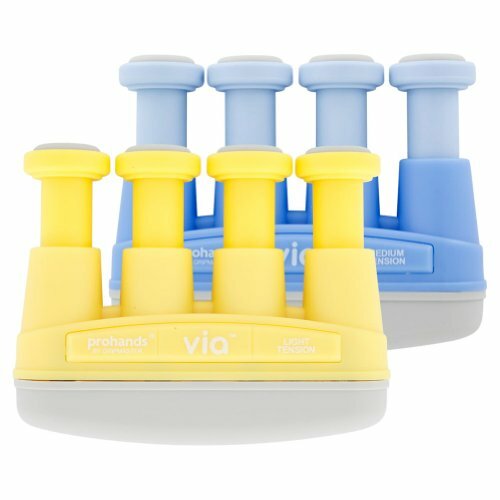 Each hand exerciser includes a complete exercise programme. Here you will find out how to isolate and exercise each finger individually by pressing down the spring-loaded finger pistons. To strengthen the complete hand and forearm, you can compress the entire unit. These exercises are brilliant for preventing repetitive strain injury, such as Carpal Tunnel Syndrome. If you suffer from arthritis or are hoping to prevent it, you should try a low strength exerciser and work your way up. Like any form of exercise, you are warned to start off gently and progress slowly and carefully. Cease immediately you feel any pain. So - if in doubt about using this form of exercise for your hands, consult your doctor. This article is for information only and is no substitute for the advice of a medical professional. It may just be a little hand exerciser, but the Prohands is nevertheless a very powerful machine! Even without all the already mentioned benefits these exercises are great looking and I could use one for my wrists as well! Jo - I never thought about using the Marigolds! Great tip! Mira - You have a point... we definitely lose strength living the urban lifestyle. We concentrate our exercise too much on one portion of our body, i.e. fingers when typing, as opposed to an overall 'workout'. These are useful for anyone. I wish we lived in nature more, to grip and grapple with things. So much of what we deal with has to do with the fact that we 're not out and about more. I see there's a trend for people to go on hikes specially designed with all sorts of obstacles -- a move away from all that exercise in a gym, which isn't all that natural, after all. I'd not thought of it like that. I'm only 41 and I've reached the point where I find it hard to open bottles. I always have to grab the marigolds and go that way. I think that these exercisers are very important for women, as many women lose hand strength as they reach middle age. How often have I had to open a bottle for an elderly or middle aged woman, and I am not young myself! But I wish that there were some way round the occasional problem that I suffer. When I grip hard for a period of time, my thumb locks and I cannot move it. Several times I have had to unlock it manually by pulling it back into position. Any ideas anyone? Hi ologsinquito - Yes, you are right, it would make a good present! Thanks for that suggestion! This is a great idea and a great idea for a present.